I will never buy jarred pizza sauce again. Why? When this is so simple? Last night was pizza night at our house. About mid-afternoon I realized I didn't have any sauce...um, need that right? So, when I made my trip downtown (and by downtown I mean, 3 blocks from my house, to a one-street downtown) I stopped at the grocery store. My eyes hit a can of all-natural tomato sauce (.47 cents!) and I thought, that is all I really need right? And then just add some spices? So, that is what I bought. I don't remember the last time I went into the store with one thing in mind, and actually only came out carrying that one thing. For me, that is a victory. Mix all ingredients together and spread on pizza crust. Or, do like me and mix up ahead of time and store in the fridge until needed. I'm thinking, the longer it sits the better the flavor? 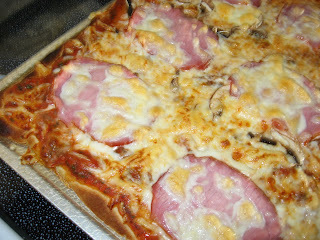 This pizza was good - Canadian bacon, mushrooms and cheese. Heavenly. But, I really don't make a bad pizza folks. Just sayin'. Today is beautiful here, a little breezy, but a high in the lower 80's! Hooray! I'm sure little man and I will get a long walk in, and I need to head to the library again to work on my secret project...any idea what that could be? It's a project that may never take off, but I'm plugging away anyway. This sounds so much better than the canned stuff! Great idea, thanks! It must have been a pizza kind of night last night...that's what we had too! I'm definitely going to try your sauce! I've been wanting to use homemade versus canned! I will be trying this. Homemade is always better when it comes to sauce and about anything for that matter! Great looking pizza...and the sauce is very simple to make!! Yum! 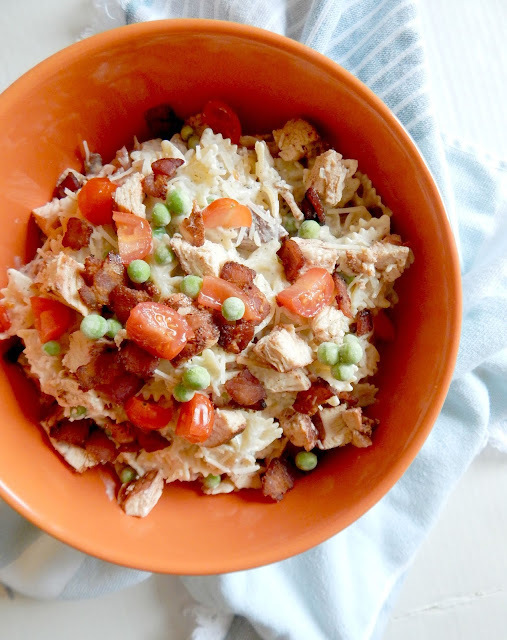 Sounds delish and easy, plus it's cheaper than the store bought stuff! I've been looking for a great home made sauce recipe. I'll be using this one for our next pizza night. Oh! What is this project!? Hmmm my guess is that your project is writing a book! 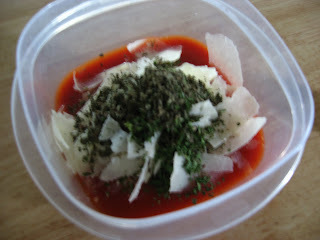 Thanks for sharing this homemade pizza sauce, must try soon. The sauces sounds great, I usually just use a jar of plain pasta sauce. 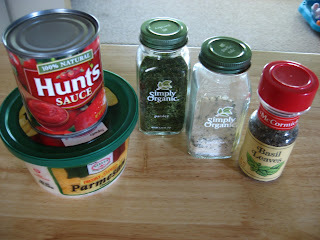 I really want to try making my own pizza sauce:) sounds good and easy! threat of missing the big event upto 50% among gametes.